4 - The first number means the magnification. In this example it is 4x normal eyesight. 20 - Means the diameter of the viewing lens (not the eyepiece) in millimetres. The tech term for this is "Objective Lens Size"
4x20 - Therefore is 4x magnification seen through a 20mm wide view lens. And what about 3-9x40 then? This means the scope has variable "zoom" capability. Unless otherwise stated the numbers are whole numbers, so on a 3-9x there will be a 3, 4, 5, 6 ,7, 8 and 9x position but not fractions or some sort of granular 3.75x type of thing. You can see the dial here on this 3-9x40. Exit Pupil: The size of the column of light that leaves the eyepiece of a scope. The larger the exit pupil, the brighter the image. To determine the size, divide the objective lens diameter by the power (a 4x40 model has an exit pupil of 10mm). The distance a scope can be held away from the eye and still present the full field of view. Unlike cartoons you don't have the eyepiece pressed up against your eye and geta balck eye from recoil! Field of View (F.O.V. ): The side-to-side measurement of the circular viewing field or subject area. It is defined by the width in feet or meters of the area visible at 100 yards or meters. 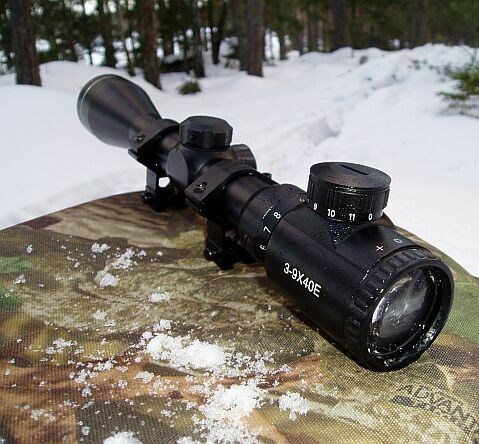 A wide field of view makes it easier to spot game and track moving targets. Which is why variable magnification scopes are so handy. Spot the target at low mag and. Lock on and zoom in. Windage & Elevation - The 2 turrets mid way down the scope body that are a key part of zeroing a scope. When you fit a rifle scope they are up and to the right. 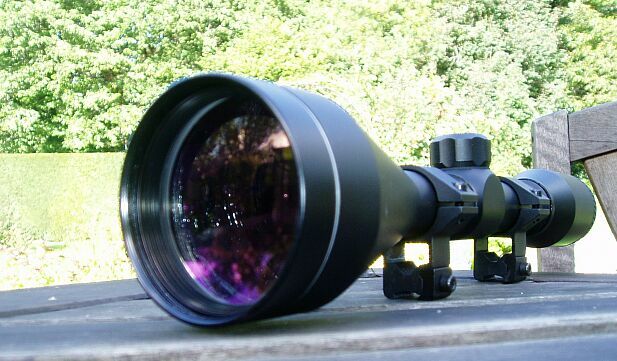 See the scope fitting page for info on this side of things. Windage - The one on the right. As the name suggests is to do with wind. It adjusts the crosshair minutely left and right. And for in the field adjustments for wind strength where, for example a high crosswind will make long range shots veer slighty. Elevation - The top on. Up and down basically. An experienced shooter will use the these turrets to make a situational zero adjustments. If you're not experienced don't worry. Just be aware and experiment as that's how you become experienced! A condition that occurs when the image of the target is not focused precisely on the reticule plane. Parallax is visible as an apparent movement between the reticule and the target when the shooter moves his head or, in extreme cases, as an out-of-focus image. Some scopes, higher prices ones typically, have parallax correction built in so that this focus problem does not occur.